The basin is approximately 2,500 kilometers (1,550 miles) wide and 13 kilometers (just over eight miles) deep. It is the largest, deepest crater discovered in the solar system to date . The basin takes up almost half of the moon's southern hemisphere. 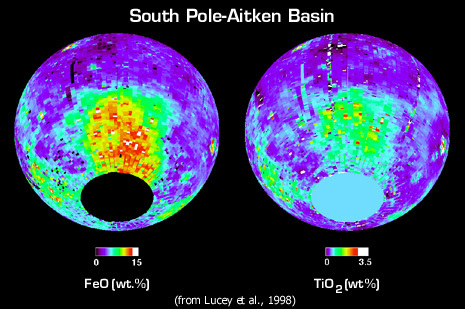 The Aiken Crater, located at the Northern end of the Basin, and the South Pole, located at the Southern end of the Basin gives it its official name; the South Pole-Aiken Basin. 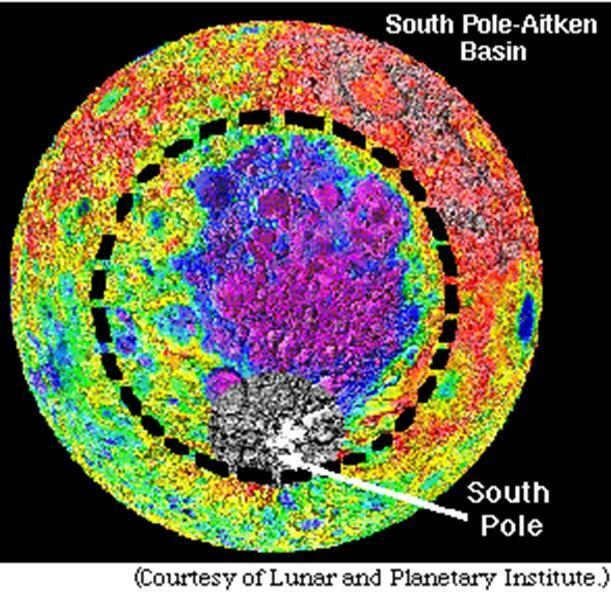 The Aiken Basin was first found bit by bit by human lunar mappers, as well as images from Galileo, Clementine, and the Lunar Prospector. The existence of the basin was suspected as early as 1962 but it was not until Lunar Orbiter Program took pictures of the basin that it's existence was confirmed . Scientists can't figure out exactly how the basin was formed, and many wonder if the same situation will ever occur with the Earth. Scientists know very little about the true features of the Basin due to the lack of exploration there and the lack of pictures taken by rovers or orbiting vehicles. One of the few things we do know is that the basin is in complete darkness 24 hours a day because of the depth of the basin and the height of the walls. The diagram below shows why the basin is in complete darkness. NASA states that the North and South Poles of the moon combined may contain as much as six billion metric tons of water ice, almost ten times what they have said in the past. They also announced in September of 1998 that the moon has magnetic poles and an iron-rich core, something new discovered by the Lunar Prospector. This is enough water to support 2000 average people for over 500 years  ! Lunar Prospector was able to detect water on the moon using its neutron spectrometer which detects water indirectly by detecting large concentrations of hydrogen . The image below shows a graph of data from Lunar Prospector's neutron spectrometer. The two dips in the graph show areas of reduced medium energy neutrons which means an abundance of hydrogen is present. 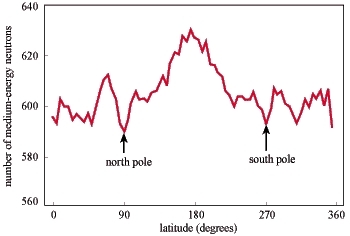 These two dips occur on the moons north and south poles . A robotic mission to the Aitken basin should begin its search for water in the areas identified by Clementine and Prospector as having possible water content. 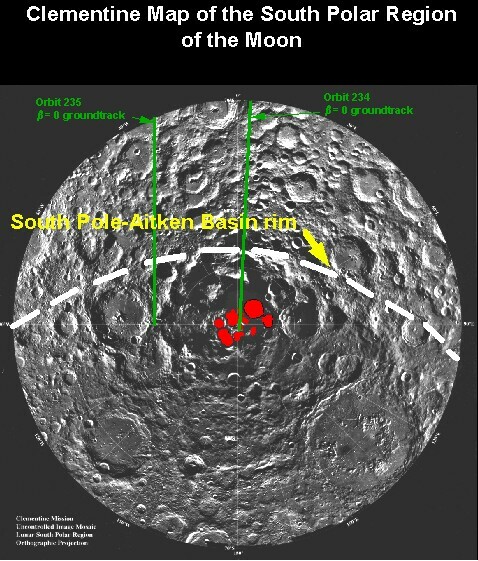 The image to the left shows the areas identified by the Clementine spacecraft as possible water sources on the moon. The areas in red indicate the signature of water ice and any mission to look for water should begin in one of these areas. However, these areas are in 24 hours of darkness and present a challenge in getting power to the rovers. Therefore, the best place to begin looking is an area known as "The peak of eternal light" . This interesting area is a ridge between craters in which areas receive sunlight but no area is permanently lit. Landing here would allow a rover to go and explore the dark depths of the crater and return easily to an area of sunlight in order to recharge. The Aitken Basin presents a number of challenges to scientists wishing to explore its depths for water. The Aitken Basin is very cold, averaging a constant temperature of -220 C . This extreme temperature is only about 50 degrees Celsius warmer than absolute zero, which can easily wreak havoc with delicate electronics and probably cause structural components to become very brittle. The Aitken Basin is believed to be an impact crater and the geology of the basin is extremely rough. Previous lunar missions have landed and explored relatively smooth areas of the lunar surface. Rovers sent to the Aitken basin will need be able to deal with the rough terrain.